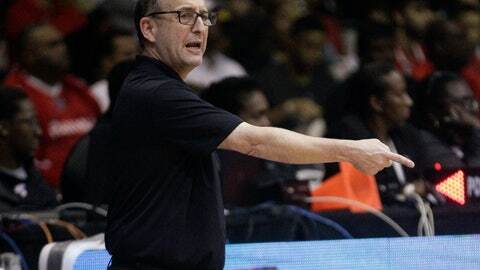 CORAL GABLES, Fla. (AP) — Jeff Van Gundy is about to coach his final game for the United States in the qualifying rounds for this summer’s FIBA World Cup. From there, who knows when he’ll coach again. Van Gundy — the coach for all six two-game qualifying cycles for the U.S. and who led the Americans into the field for this summer’s tournament in China without navigating any serious trouble — will send his team out to face Argentina at Greensboro, North Carolina, on Monday night in the final qualifying game for both nations. Both teams have already clinched spots in the World Cup. All that’s at stake in the finale is first place in Group E; both teams go into Monday night with 9-2 records. Van Gundy has gotten the Americans to that point despite being handed a very different roster for each qualifying cycle, and he has used more than 50 different players with “USA” across their chests so far in the tournament. Van Gundy hasn’t coached in the NBA since the 2006-07 season. He’s been a television analyst for ESPN and ABC since, and is generally considered one of the best commentators in the game. He’s part of the lead crew on ESPN, often working with Mike Breen, Mark Jackson and Doris Burke. Burke has been with Van Gundy for some of his practices, and she marvels at how well he teaches and how fast he processes the game. It’s likely that Van Gundy will remain involved with the U.S. team for the World Cup in some capacity. The team that will play in China starting on Aug. 31 will be coached by San Antonio’s Gregg Popovich, who’ll have a roster stocked with NBA superstars — while Van Gundy went through qualifying with G League players. Popovich, countless times over the last several months, has lauded the job Van Gundy has done. Van Gundy said coaching the U.S. in qualifying didn’t necessarily stoke his desire to keep coaching. He’s never wavered on that. There will be 32 teams playing in China this summer, and 29 of those spots have now been claimed. Serbia, the world’s No. 4-ranked team, finally clinched its spot out of the European qualifiers with a 97-76 victory over Israel on Sunday in the last qualifying game for both teams. Russia also clinched its spot Sunday, needing a late 33-11 run to rally past Finland 91-76. Other qualifiers Sunday included Ivory Coast, Japan, Jordan, Iran and the Philippines. Brazil, Senegal, Italy and Poland also clinched their spots in the field over the weekend. Ivory Coast won three games in three days to get in, and needed to beat Mali on Sunday in that last game by more than 13 points to qualify — getting the job done with a 69-49 win to grab the fifth and final spot allocated to the African qualifying region. China got in automatically as the host. Tunisia, Nigeria, Greece, Germany, the Czech Republic, Lithuania, Australia, France, Angola, New Zealand, South Korea, Spain, Turkey, Venezuela, Canada, Argentina and the U.S. qualified before this final window as well. World No. 7 Slovenia and No. 9 Croatia were the top-ranked teams that failed to qualify. The last three World Cup berths will be won on Monday. Europe gets 12 teams, and the last of those berths will go to Montenegro or Latvia. Those nations play Monday, and Latvia must win by nine points or more to earn a trip to the World Cup. Otherwise, Montenegro goes. And the last two of seven spots out of the Americas Region will also be decided on the final day. The Uruguay-Puerto Rico winner is certain to get one, and the Dominican Republic is likely to get the other. The draw for the World Cup is March 16 in China.